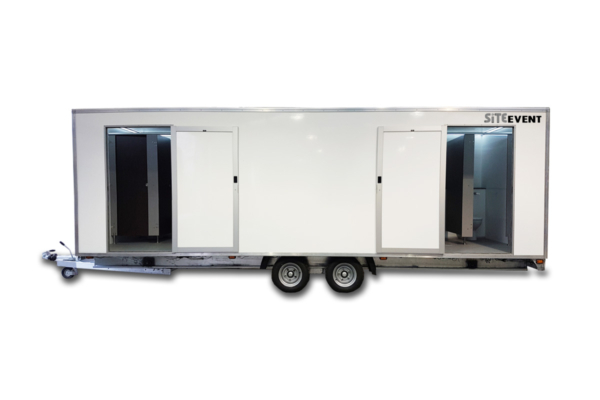 The ultimate in mobile loos, the 8 bay toilet trailer combines 8 toilet cubicles, which can be used by all female, all male or can be separated into male and female. We suggest a maximum of 400 people over an 8 hour period for any event. Manufactured by our sister company Site Build in 2017, to the highest quality finish this unit is guaranteed to be a show stopper at your event. Inside the event luxury 8 bay toilet trailer is quality sanitary ware, spot lighting, contemporary vanity units, chrome taps, laminate flooring and an automatic air freshener dispenser. If you require any assistance do not hesitate to call our friendly sales team on 0800 371 994. The 8 bay toilet trailer requires a 16 amp power supply to run the unit, all waste and water is self contained. However we would recommend having a water supply on hand to top up the water tank to ensure your guests always have fresh water to wash their hand with. The luxury 8 bay toilet trailer needs to be situated on flat, even ground to ensure the trailer is level. For more formal occasions or where the footfall is high Site Event can offer the services of our uniformed attendants, specifically to ensure supplies are kept topped up, loos are kept clean and the unit tidy. Additionally, our NSQ qualified uniformed technicians are on hand for an immediate response, thus making certain there are as little interruptions, if any, to the proceedings. Our brand new contemporary 8 bay toilet trailer unit offers your guests with a spacious sleek washroom space whilst catering for high volume crowds. Each bathroom contains a vanity unit, ceramic sink, mirror, toilet, hand towel dispenser and a limited cold water supply in a fixed tank. The extra large doors allow for numerous people entering to ensure a healthy traffic flow, to ensure ultimate efficiency. As with all of our toilet trailers we mask the wheels with skirting and provide safety steps up to the 2 entry doors. By using multiple built in halogen lighting the whole environment is given a bright and airy feel. Using modern, easily wipeable materials and clever design we have strived to create a welcoming and pleasant atmosphere. We see the type of functions as being larger weddings, festivals or corporate gatherings.